When it comes to investing in boots for the winter, it can be tough to find a pair that look stylish and also combat the snow, wetness and sludge, all while keeping your feet warm and snug. Many winter boots are chunky and obnoxious, and while your tall leather Michael Kors may be super chic, if the streets are full of sludge and muck, there’s no point in taking the chance of ruining them. There are so many fun winter activities that require ultra warmth and protection. Whether you’re going to cut down a Christmas tree at a tree farm, going sledding with your friends or little ones, or taking a stroll through a holiday market, the last thing you want is cold wet feet. Finding a weather-proof boot with insulation and a cozy lining will get you comfortably through the coldest winter months. And looking good while doing so? That’s a major plus! Take a peak at our picks for the 5 most stylish and functional winter boots to get you through the season with ease. With their sleek silhouette, waterproof leather and fur detailing, these winter boots by UGG stand up to temperatures that drop to -20 °C. With premium materials and cold weather technology that includes both insulation and breathability, these fashionable boots are functional as can be for wintertime. Style and practicality come together in this tall, fleece-lined boot. The topline is elasticized, which makes them easy to slip on and off, while also trapping heat inside the warm interior. Plus, they have a treaded rubber sole for secure traction on slippery surfaces. Beat snow, slush and muck all while looking amazing doing so. Sorels are a classic winter boot, and while some of the styles are rather chunky, these full-length waterproof boots are extremely chic. With gold hardware, full-grain leather uppers and a stacked leather heel, these boots were made for taking on the winter elements in style. They’re constructed with a bungee and lace enclosure for a snug fit and a waterproof outer shell to keep your feet dry. Keep the wind and snow at bay with these moto-inspired winter boots. They boast waterproof leather and a plush shearling lining for extra warmth. A practical inside zipper allows you to take them on and off with ease, and the rubber outsole provides exceptional grip for the icy ground. I love the quilted detail of these pull-on boots, as well as the dark green colour of the foot. They’re 100% waterproof and lined with plush material to keep your feet warm as you trek through the snow. Temperature rated to -30°C, this eye-catching boot is ideal for blustery winter days. 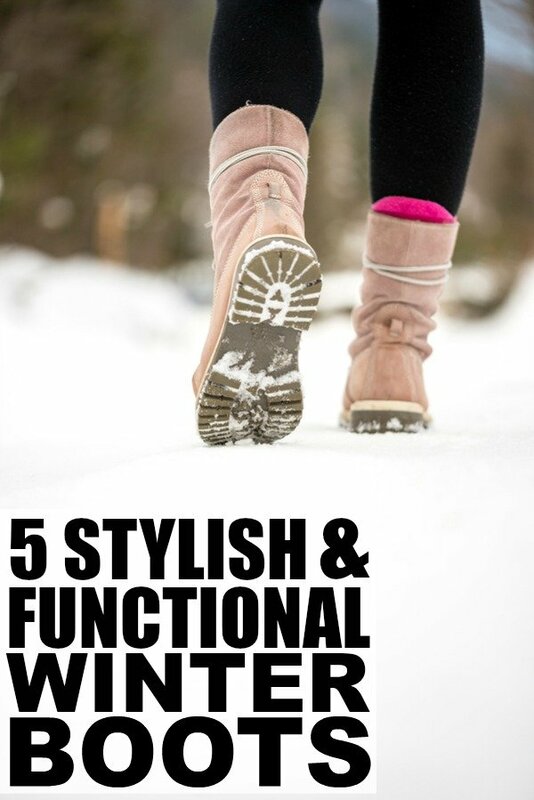 If you like these stylish yet functional winter boots as much as we do, please share them on Pinterest! And if you’re looking for more fashion inspiration, please follow our Fashion board where we share all kinds of trendy options to keep you on style throughout the seasons!